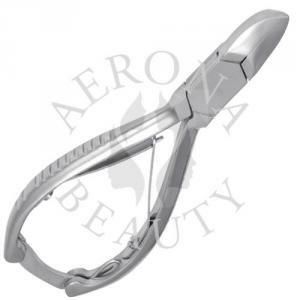 Quality stainless steel professional nail nippers manufactured by Aerona Beauty add sleek sophistication to any beauty routine to snip in style with ultimate accuracy. The handles are calibrated with single & double spring action needing only the slightest pressure for smooth trimming and are designed for both righties and lefties. Features sharp,long-lasting snipping tips for smooth cutting.Not for use on Acrylic nails. Great to take to the Nail Salon.